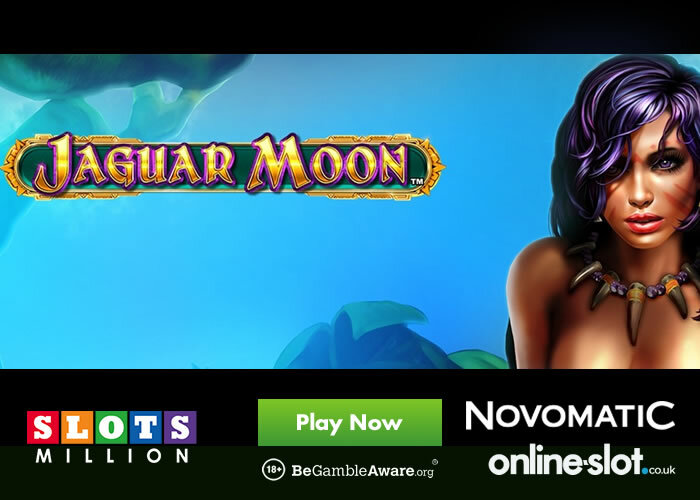 SlotsMillion Casino offers you over 1,300 slots with 63 (at present) from Novomatic – their latest game, Jaguar Moon, has just been added. Savage action in the jungle is guaranteed with the 5 reel, 243 ways to win Jaguar Moon. Powered by Novomatic, you can spin away from just 25p a spin on desktop, mobile and tablet devices including iOS, Windows and Android). Set in a lush rainforest, symbols on the reels include jaguar paw prints, golden jaguar statues and a dauntless huntress. As you would expect from a Novomatic production, the gameplay revolves around triggering the Free Games feature. The scatter can appear as a single symbol or as 2-high – this can lead to 4 options. You can get 8 free spins with a doubling multiplier, 12 free spins with a 3x multiplier, 15 free spins with a 4x multiplier or 20 free spins with a 5x multiplier. Hopefully you will trigger the feature with 3 2-high scatters as each free spin can reward you with 2,500 times your stake (500 times stake max win multiplied by the 5x multiplier). For more details, check out the Jaguar Moon slot review where you can also try for free. As mentioned, they have lots of Novomatic games – this includes recent arrivals like Irish Coins, Book of Ra Magic, Stein Haus, Eye of the Dragon and the film-inspired From Dusk Till Dawn! They have also added other new games like Quickspin’s Big Bot Crew and ELK Studios’ Joker Gems. Not played at SlotsMillion Casino before? New UK players are welcomed with a 100% first deposit bonus up to £100 as well as 100 extra spins – you will get 20 extra spins each day on a selection of NetEnt slots. If you’re a regular player, you will appreciate the fact they don’t charge any fees for withdrawing and process cashouts almost immediately! They also have a Lock My Withdrawal service meaning you cannot cancel a cashout once requested – this means you cannot be tempted to play with your winnings.